Bushfire Certifiers is a multi-disciplinary bushfire consulting service that provides a complete range of bushfire assessment services including; Bushfire Threat Assessment Reports, BAL Assessment Certificates, Construction Standards, Alternate Solution Reports, Bushfire Certification, Emergency Management, and Pre-purchase Bushfire Inspections. Bushfire Certifiers is an FPA Australia Corporate Silver Member. 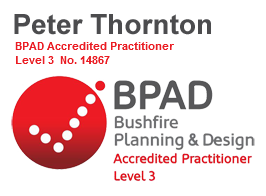 Having a BPAD Accredited Practitioner on board means Bushfire Certifiers is listed in the FPA Australia Providers of Choice search and appears in the listing under “Bushfire Consultants (BPAD)” category. Our team comprises highly qualified and experienced building surveyors and a BPAD – Level 3 Accredited Practitioner capable of preparing Bush Fire Threat Assessment Reports to comply with both the acceptable solutions and the performance criteria of state based legislation. Recent projects include re-zoning developments, subdivisions, alternate solutions for infill development, and special fire protection purpose development.